One of the biggest battles you will come across in today's book world is the battle between lovers of printed books and eBook lovers. There are some people who just won't stand for any of that digital nonsense; they'd much rather have a 'proper' book to hold in their hands (and some even go so far as to accuse e-readers of destroying the whole concept of a book). Others think that print books are simply out of fashion, and the book has evolved into something more sophisticated, that is, the eBook. I, like most people, fit into the middle ground between the two extremes (though I do lean slightly more towards eBooks). I think e-readers have certainly revolutionized the reading experience, quite possibly for the better, but there is nothing like the feel of an actual, printed book in your hands, the smell of the glue, the rustle of the pages. 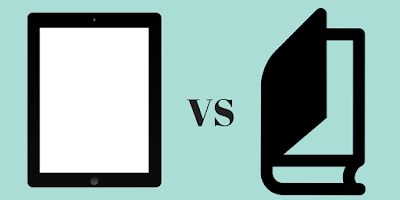 So, partly for the benefit of those who can't quite make up their mind about eBooks and print books, and partly to get things straight in my head, I'm going to outline the differences between eBooks and print books, and see what's what. Round 1: Space. I currently have around 200 books on my Kindle, and there's space on there for 3300 more! That's more books than I'll ever read in a lifetime, squeezed into a space no bigger than a DK Early Reader. How many bookshelves would it take to store 3500 printed books? I dread to think. eBooks 1, print books 0. Round 2: Ease of use. Let's face it, you'd have to be pretty dumb to work a book incorrectly. I still struggle with using my Kindle sometimes. eBooks 1, print books 1. Round 3: Durability. E-readers are pretty durable as technology goes. The only way you might accidentally break one is by dropping it in the bath, and a printed book wouldn't be much use if you got it wet either. Print books can also get ripped, and e-readers can't. If you take good care of a print book, it could very well outlast an e-reader, but the difference is really negligible. eBooks 1, print books 1. Round 6: Acquisition. If I want to buy a print book, I have to either go find it in a bookstore, or order it online and wait for it to come to me. Both of those things take time. However, if I want to buy an eBook, I can find it online and have it on my Kindle almost instantly. It gets even better than that, because most e-readers can access their respective stores without having to connect to a computer. So if I have a sudden urge to buy, say, The Hunger Games, I can be reading it in less than two minutes without having to leave the sofa. Another great thing about buying eBooks is that they are, for the most part, cheaper than their printed counterparts, and most of the classics are available as an eBook for free. eBooks 3, print books 2. Round 7: Aesthetics. This is a big one for most people. An e-reader, let's be honest, isn't very pretty. It's not colorful (as far as I know, all of them only display black and white), it's made of metal, and you can't get coffee stains and breadcrumbs all over it because they just wipe off. Print books, on the other hand, are wonderful. They crinkle, they bend, you can fold the pages over, you can write in them, you can make them yours. There's just something about a printed book that just seems 'proper' and 'right'. I think the best thing is that they smell of glue and paper. When I smell my Kindle, all I smell is plastic. Maybe all this is why, when I got the proof copy of my first printed book earlier this year, even though I've been publishing my books (on Kindle) since 2011, I felt that thrill again of being published for the first time. It was like, "Yes, NOW I'm a proper author!". Anyway, this is a very long-winded way of saying, eBooks 3, print books 3. And that's it. That's eBooks vs print books. And the scores are tied. 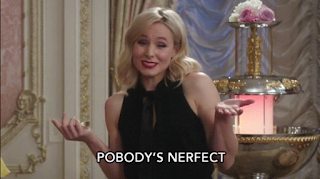 So basically, it's all down to personal preference. Do you prefer the quick and convenient eBook? Or are you a fan of the flippable, nostalgic print book? Please do share your thoughts in the comments!